Malta was a country I thought I wouldn’t get to for a long time and somewhere I honestly didn’t know much about until I met some Maltese friends in London. It’s one of those places on the map that you need to zoom into to find much like Singapore. We had heard amazing things about this place; beaches, sun, Mediterranean culture, great food, fun people, all packed into a tiny island. But then came the invitation for the wedding of the year. And all of us friends couldn’t wait for July to come. Plans were made for beach bodies (only one of actually made that goal), flats were booked, flights were sorted out. We were about to see this elusive country that we had heard so much about. First impressions of Malta was that it was very arid and looked quite Middle Eastern with its stone colored buildings and palm trees. But it has also has a distinct European feel to it as well with the number of cafes, bars and restaurants around. Our friends picked us up at the airport and whisked us away to our flat in Silema. The area we learned quite quickly was pretty touristy but very close to the water – only a 10 minute walk. These rocky beaches were something new for me – I usually think of a beach with sand but these are much more cleaner – just take a quick swim without having to worry about sand in your bathing suit afterwards! 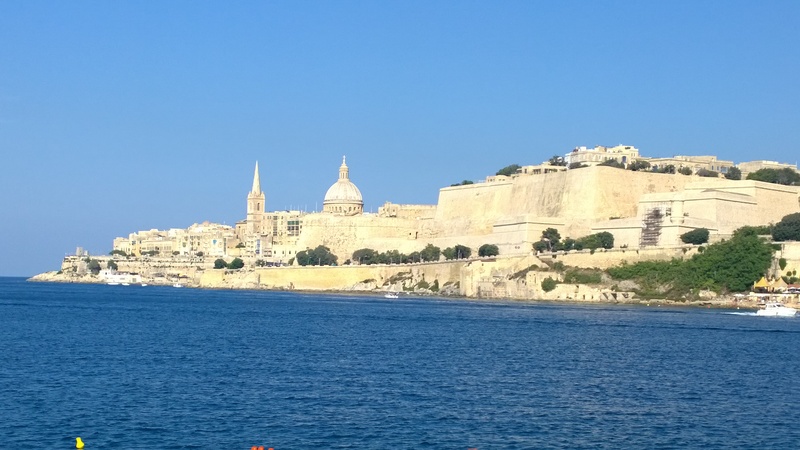 Our first item was to have lunch and explore Valletta (the capital) since we didn’t have a lot of time to explore the island. Valletta was beautiful. 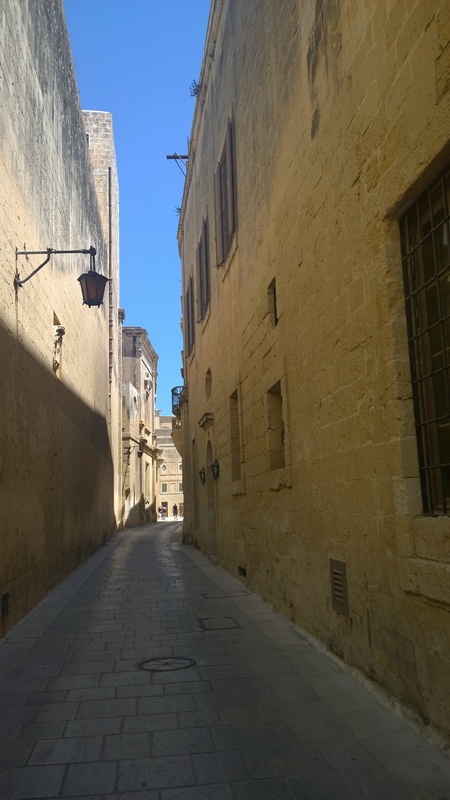 The old town was a maze of small alleys, staircases leading to streets with cute cafes and restaurants.The next morning was Mdina (pronounced mmm deena), a medieval town about an hour away from Valletta. 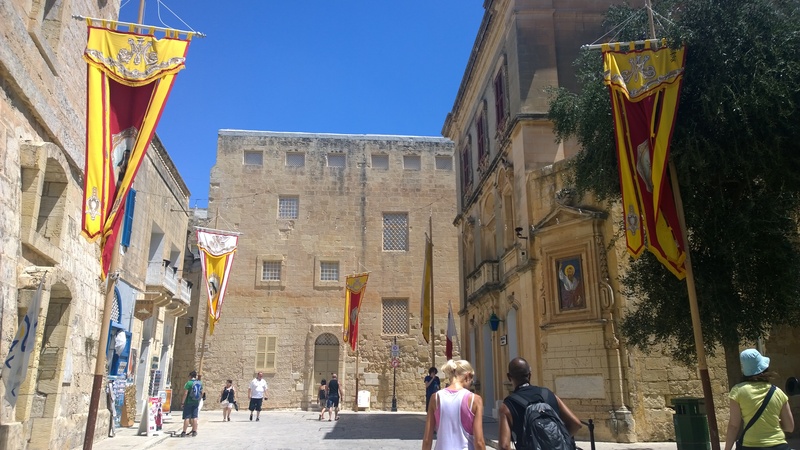 Mdina was the old capital of Malta and very historical and grandeur with it’s palaces. It’s dubbed as the ‘silent city’ because no cars are allowed within the city. It almost seemed like a tourist attraction rather than a residential place because of this. Thinking back, it had a bit of eerie feeling to it, like a ghost town but one that many still visit and live in. Later that day was the evening of the wedding. I love weddings. They’re always fun, filled with good company and food. The ceremony was held at the university chapel of where our friends first met and went to university. The ceremony was beautiful and although I only understood half of what was actually being said since it was in Maltese, I was honored to be a part of their special day and experience a wedding in another culture. The reception was held at the beautiful Phoenicia hotel in Valletta. Guests were whisked away in an old school bus from the chapel (fun!!) and treated to a 24 course tapas style dinner with traditional dishes such as rabbit and pastries. It probably would’ve been better if we hadn’t forgotten there were that many courses and filled up too much on the appetizers 🙂 We danced away until the our feet couldn’t anymore. 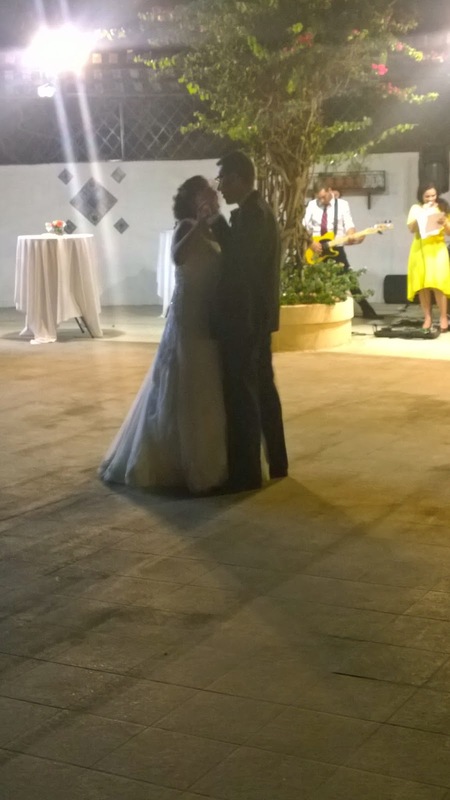 It really was a truly special experience – thanks Bernard and Cecilia for letting us be a part of your special day! The next two days were for more exploring and in particular beach time. The Blue Lagoon is amazingly beautiful with the bluest waters. It was quite crowded so getting a seat under an umbrella was a struggle but the day was spent soaking up the sun, playing in the water and napping on repeat. The last day we spent on Gozo, a separate island in the north. It was quite far so a car is definitely recommended, especially since on the actual island you have to take a bus from the center each time you want to visit a different part of the island. We got to see famed postcard style scenery such as the Azure window. 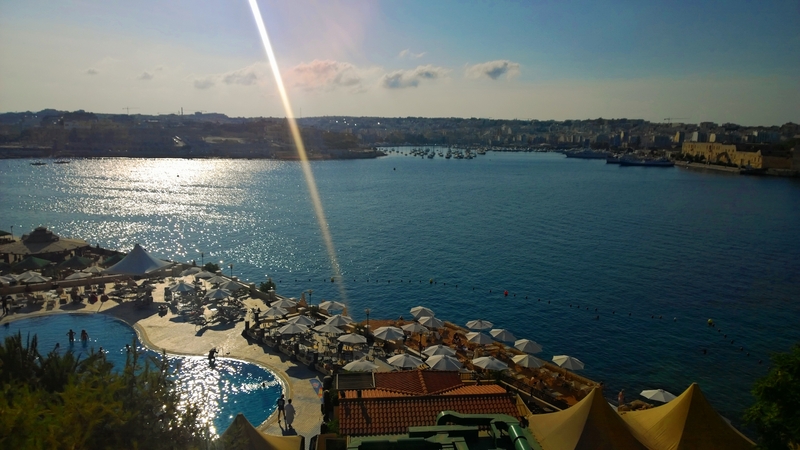 Malta is a place I’d really like to visit again. Many people (Brits) have holiday homes there and I think they’ve got the right idea. The weather is excellent, especially in the summer time, a really chill place. The culture is also really fascinating. A mixture of Arabic, Italian and English – it really has best of all worlds.